Get Postman setup on your computer so that you can start testing API requests with ease. 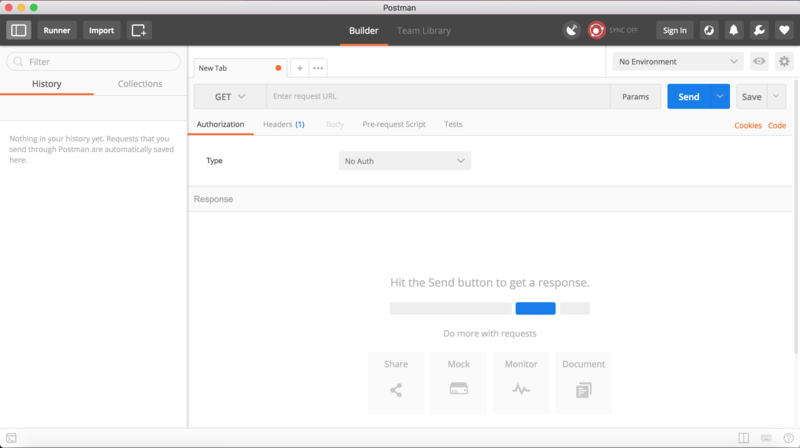 Postman is a GUI that aids in the development of APIs by making it easy to test requests and their responses in an organized way. Everything you can do in Postman you can also do through the command line, but Postman makes the process quicker and easier by providing a clean interface and powerful set of tools. You can download the App for free at Get Postman. Choose the package for your operating system, and then unzip it to install. We have created a simple backend that you can interact with to get comfortable with making HTTP requests. This backend uses a SQLite database to store users. Each user has only a username (String) and a password (String). For now, we only have the GET and POST requests set up. Download the example backend directory here. Navigate into the directory through your command line (use cd example_backend from whichever directory you unzipped it into). Make sure you have Node installed. To check, you can run npm -v on your command line. If you see a version number, you have Node. If the npm command is not found, you should follow these steps to install Node. Run npm install from inside the example_backend directory to install all of the project’s dependencies. To start the server, run node server.js from inside the example_backend directory. Now, this simple server should be running at http://localhost:4000. Next, we’ll see how to interact with this server using Postman. Make sure the dropdown is set to GET. Enter the URL localhost:4000/users in the textbox that says “Enter request URL”. This tells us that there are currently two users stored in the database. One has a username with the value “1lameuser” and a password with the value “secret_password”, and the other has a username with the value “cool_user_87” and a password with the value “notPassword!”. These GET requests only retrieved resources from the server. No information was changed. Next, we’ll look at how to use Postman to send requests to add users to the system. We can use POST requests to add users to the database. Let’s practice with sending some POST requests. Change the type of request from GET to POST using Postman’s dropdown selector. Add the request URL (localhost:4000/users) in the appropriate textbox. In order to create a new resource in this database, we need to supply a user object to create in the body of the POST request. Select the “Body” tab and check the “raw” radio button to specify input. Press the Send button to send the POST request. This response means that a user with username “wholeNewUser”, password “IllNeverTell”, and id 3 was added to the users resource. Let’s try sending some more requests. Add a user to the system with your first name (as a String) as the username and your last name (as a String) as the password. Use POST to do this, with a user object in the body as a JSON. Look at all of the users contained in the users resource now. Use a GET request to do this. Retrieve the user with id 4 only. Use a GET request with a specified id to do this. Great work! 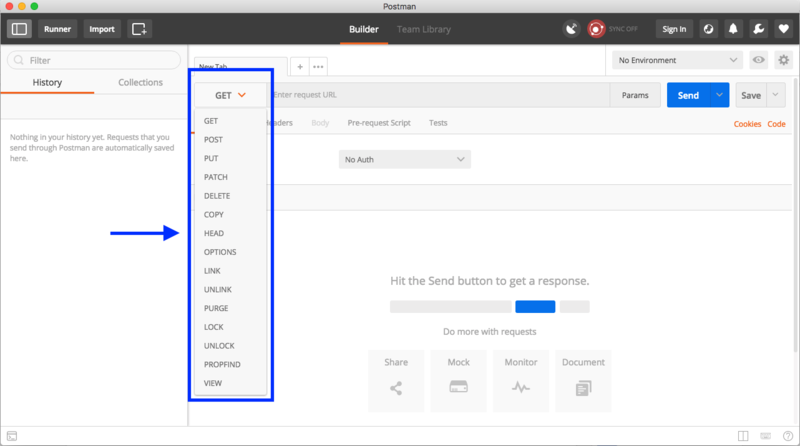 You now can use Postman to make requests and see the corresponding responses. This will be very helpful in testing and understanding the APIs you build.